Instagram is testing a new way of navigating through posts – by tapping through them, just like users tap through Stories. The new navigation system sees users tapping the sides of the screen instead of scrolling up and down with their finger to advance forwards and backwards between posts, which can get tiring after a while. It also means users always see media full-screen rather than having to adjust the view with a finger scroll to see the entire post. It's a navigation method that was first used by Snapchat, a platform Instagram isn't shy of taking cues from. 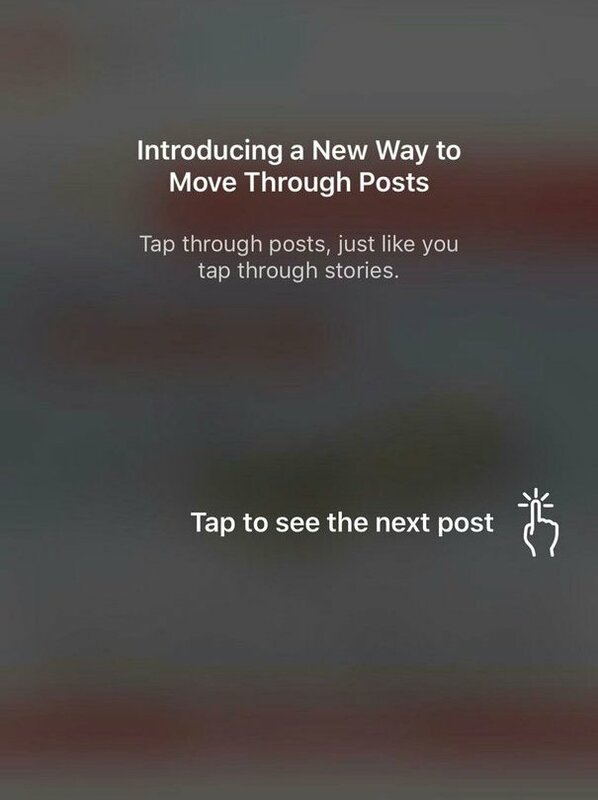 Instagram confirmed to TechCrunch that it is testing tap-to-advance in the Explore tab with a small number of users, who were presented with a pop-up in the app explaining the change. As for whether the system could be adopted for the main feed, a spokesperson for Instagram said that wasn't something it was actively thinking about at the moment. Meh. What would go over way better with users is making the feed chronological again. Sooo instead of thumb fatigue... You get tap fatigue. Now if only they come up with something for ad fatigue. It also means that along with real posts always taking up the full screen, adverts will also take up the full screen and wont be able to just be quickly flicked past when you work out that they are placed every 5 posts. Can't they make the full post stick 'magnetically'? As a photographer, I engage with a lot of people on IG - it's the perfect platform for photographers. I never watch the IG TV and only rarely the stories (and then only select accounts). I miss the days where my IG feed was just a collection of lovely photos and inspiration. The technology is astounding. The Human factors advances are groundbreaking. Really? this is news that anyone cares about? No doubt so they can shove more ads in your face like they do with stories. I’m sorry, but if you are on Instagram for long enough periods that you are experiencing “thumb fatigue” you really need to evaluate what you are doing with your life. Regardless, this has less to do about saving the poor thumbs of those who would rather live vicariously through influencers; and more to do with forced advertisements from Facebook. I’ve thought this. Can’t remember what the app was that I used with it. This way however means the can insert a nice full screen or half screen ad ever 20 “page turns”.